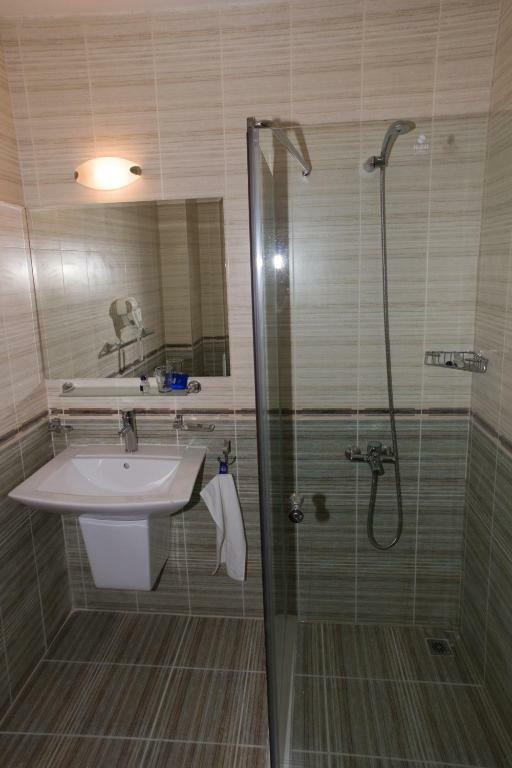 Decent room, very warm, simple clean and normal location. We enjoyed the comfort of the apartment and of the hotel overall! Evan if we had a situation with the electricity the staff was very nice and prompt and moved us into a similar apartment.The staff was very nice for all the duration of our stay! Great space, comfy beds and well supplied kitchen. Warm with plenty of hot water. In a good location, not far from the gondola. This is the first time I actually have nothing good to say. The location is good if you wish to be close to the ski gondola and all the fancy, crowded restaurants and pubs. The gondola shuttle was ok. The room was big and very warm. For the money paid the place was satisfying. Convenient location for ski facilities. Good small supermarket minutes away with very helpful staff. Great selection of places to eat. Some staff very helpful but felt they were embarrassed by state of the place. 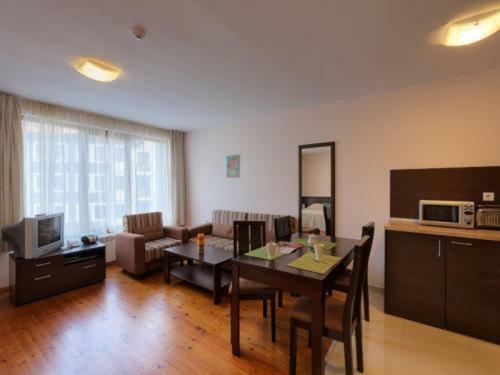 Big comfortable apartment, very warm, fully equiped kitchen, big windows and balcony, free shuffle bus to the gondola, price. The shuttle bus to the slopes was brilliant, meaning we didn't have to walk far with our ski equipment. The bus was always on time and plenty of room for everyone. Lokacija je odlicna. Pogled na planinu fantastičan. Apartman komforan. Ljubazno osoblje. Grand Montana Hotel This rating is a reflection of how the property compares to the industry standard when it comes to price, facilities and services available. It's based on a self-evaluation by the property. Use this rating to help choose your stay! 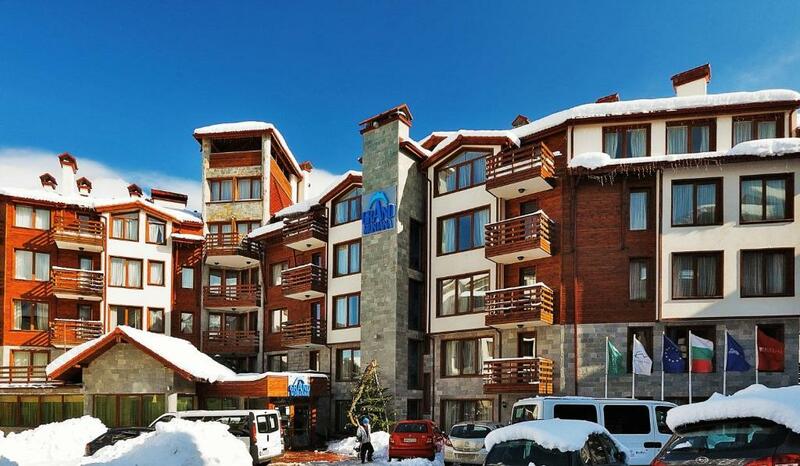 Grand Hotel Montana is located in the most prestigious part of Bansko, 2,650 feet from the Gondola elevator, providing easy access to all the resort's attractions. Free WiFi is provided in the public areas. The hotel's facilities include a spa and sports center, swimming pool and restaurant. Available for all guests is a free ski-bus to and from the Gondola. 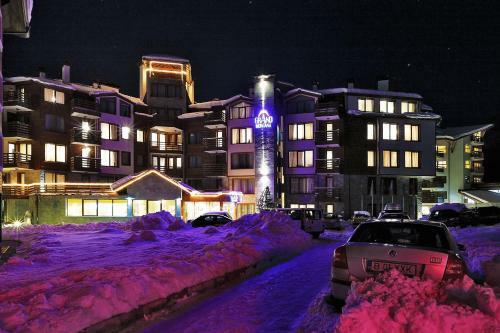 The snow capped peaks of the Pirin Mountain and the white slopes of the modern ski center can all be seen from the hotel. The property also offers packed breakfast at a surcharge. When would you like to stay at Grand Montana Hotel? These 18 apartments measure between 700 ft² and 753 ft². Each consists of a bedroom, kitchenette, a living room (with dining area) and a luxury bathroom. Each apartment is equipped for 2 people, though there is an option for a 3rd and 4th guest on the folding sofa bed. These 20 apartments measure between 1023 ft² and 1,292 ft². Each consists of 2 bedrooms (one with twin beds) and 1 or 2 bathrooms. 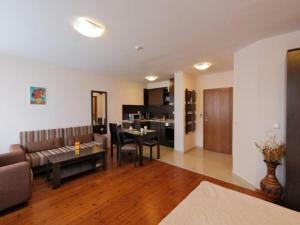 Each is equipped for 4 people, though there is an option for a 5th, 6th and 7th guests on extra beds. House Rules Grand Montana Hotel takes special requests – add in the next step! Free! One child from 0 to 4 years stays free of charge in a crib. Grand Montana Hotel accepts these cards and reserves the right to temporarily hold an amount prior to arrival. You have to pay for wi fi. I repeat, you have to pay for wi fi in 2019. It's not only this. For example for two in the room for a weekend you have to pay 7 leva (3.5€) per device. I say it again. They charge the wi fi per device. Unacceptable. The hotel parking was full of snow. When I noticed it to the receptionist he replied "yes it needs to be cleaned but who wants to clean it". Not a correct answer for a professional. The breakfast is very poor. I 'll never visit it again. The swimming pool water was dirty and sauna didn't work right. They didn't clean the room which it was already dirty and the smell was awful. The worst stay i ever had. The cleaning of the rooms could be emproved:). Also it would have been nicer if all facilities would work, like the wet sauna or the jacuzzi. Unlike advertised, the hotel does not have secure ski storage. The pool did not have water in the jacuzzi and steam room was not working. The shower in the bathroom did not work well. First of all, hotel receptionists were awful. They did not give any useful information or do their job right. It felt like I was given my room for free. The ski equipment storage room was completely without any protection so anybody could come in and take your ski equipment. Therefore we kept our ski equipment in our room. There was another problem that emerged because of that. The elevator is not on every floor only in the middle section of two floors so you must go up and down the stairs with all of your ski stuff all dressed up. Spa area was not working as it is written here on Booking. Only the pool is working and it is too small and in awful condition. The worst thing was the bed it was almost too bad and uncomfortable to sleep on it. I even wanted to go to other hotel because of it. Room was dirty and all the dishes were dirty too so you first have to go to the shop and buy a detergent and sponge. 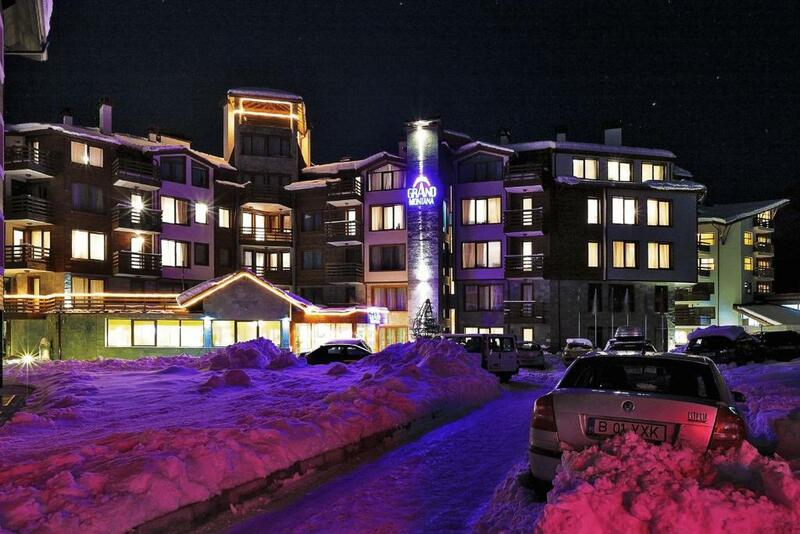 I visited Bansko for 5th time and this was by far the worst accommodation I have ever stayed in. Don't book this hotel. Nothing reminds of a 4-star hotel, not clean linen, no decoration at all in the apartment. Although there was a subterranean parking we had to park on a muddy field nearby. Not all stuff speaks English. It was not clean enough and needs to be renovated. It is not a 4star hotel. If it was a 2 or maybe a 3 star hotel and the bathroom was more taken cared, i would be more flexible with my expectations but since it appears as a 4 star many things must change. The spa facilities could have been better. The spa pool was empty and not working, and the steam room was also switched off for the entire duration of our stay. Our apartment wasn't bad but we had to help our son and his family get a 'better' room as he had an infection and the room they had stank of smoke. Photos of rooms on website show toaster and coffee maker. We had neither. No bottle opener but there was a nut cracker!! Curtains were very dirty. Beds basic but clean and comfortable. No bedside lights. Certainly not a four star hotel. Felt a bit like a student hall of residence. Cracked plaster on walls. A little maintenance could make quite a difference. Why don't they check the inventory before guests arrive. I could have complained more but didn't want to spend more of my holiday doing that. Oh there is no proper lift. Receptionist took us upstairs with our heavy cases and then announced that we were in the wrong block. Ended up with a sore back and a wrecked suitcase from bouncing it up and down stairs.